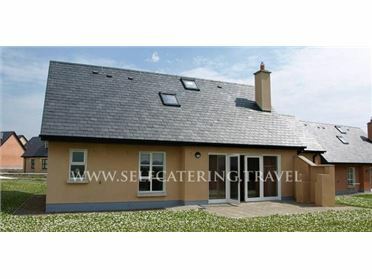 Set on the shores of Lough Doon, this modern detached property is just two miles from Broadford in County Clare. With a spacious layout and flexible bedroom arrangements - two upstairs and two downstairs - the cottage is able to sleep up to eight people. To the rear of the property is a bright and airy sun room with magnificent panoramic views across the lake and the surrounding countryside, whilst other accommodation is composed of a large fitted kitchen and spacious sitting room with flame-effect gas fire. The property is well placed for a number of great fishing spots, as well as being within easy reach of the amenities of Broadford. Situated 12 miles to the north of Limerick in County Clare is the picturesque town of Broadford. Surrounded by the wooded slopes of the Bernagh Mountains, this little town is a popular location for those who enjoy hill walking and cycling. It is also within easy driving distance of Lough Doon - an incredibly scenic place with a picnic area that is ideal for fishing and angling. The impressive Lough Derg - a large and beautiful lake with a number of interesting sites dotted along its shores - is also close by. Broadford itself is well placed for accessing the vibrant cities of Ennis and Limerick - both of which offer great shops, mouth watering restaurants and lively entertainment.